This is not the greatest blog post in the world. I was writing earlier today what was summing up to be one of my best posts. I was on fire this morning, writing with wit and candor and, trust me, you would have loved it. Unfortunately I did something funky with my thumb in the mousepad area of my laptop and it all just disappeared. I tried several things to recover it but, since I couldn’t even access the word processing program, I rebooted and lost it all. It’s too bad, it really was rather good. So, anyway, I was telling you about my weekend, about having bold and grand plans that were thwarted by pesky facts and how I changed gears, revised my plans and learned a little something about myself. I had grand plans for the weekend. After work Saturday I borrowed a tiller from Rob and was going to spend the afternoon Saturday and day Sunday breaking new ground and building beds in the newly cleared area of the Back Forty. I was excited too. This was a beast of a tiller and I was sure it was up to the task. We got it to the house about mid afternoon and after a quick lunch set to driving it up the hill to where we planned the new garden. I gained a new respect for this monster as I wrestled it up the incline but knew once I had it on flat ground it would prove it’s mettle. I mentioned pesky facts. In my enthusiasm to “get gardening” I neglected to consider the landscape. By that I mean truly consider the landscape. We chose our site because of it’s flatness but we didn’t really consider what flat meant. The growth we removed was scrub, privet, wisteria and briars, none of which was older than ten years. The flat area is a cut into a hillside underneath the powerline service that runs to my neighbor’s house. What I didn’t consider is that what I was about to till was a mere inch of topsoil over good ole Alabama clay. This was a cut that was bulldozed to facilitate to installation of the powerline and therefore not the rich loamy, forest floor I had assumed it would be. There is a a single, fundamental rule when borrowing a tool. Don’t break it. Breaking a tool defeats the spendthrift nature of borrowing. In fact, you’d have been better off to just buy yourself the tool rather than borrow it, as it has now become twice as expensive. It’s twice as expensive because you have to both fix or buy the tool and then give it back to the person you borrowed it from. Don’t buy or fix and use, as you run the risk of breaking it again and then where would you be? No, buy what you broke and then buy yourself the industrial version and chalk it all up to experience. Next time maybe you won’t be so stupid. It was these concepts of economics and friendship I contemplated as I attempted to break ground and not tiller. A cherry red exhaust, coupled with smoking, squealing drive belts finally drove it’s point home and I realised that this was not the earth from which I would draw my family’s rich harvest and bounty this year. As I mentioned last week (you did read last week’s post didn’t you?) Stephanie and I were going to experiment with one or two hugelkultur beds. I had gotten the idea from Mike at the Backyard Pioneer and with the abundance of rotting logs at my disposal this seemed like a grand experiment. Faced with breaking the tiller or myself I made one of those defining executive decisions that marks my tenure as titular head of Emerson’s Acre. Actually, I hemmed and hawed. I paced up and down and wrung my hands and finally called Samantha to help me weigh the decision. It’s here we get to the “learning about myself” part. Shifting from breaking new ground to building raised beds hugelkultur style is really a “no-brainer.” The raised beds are way easier, and therein lies the rub. 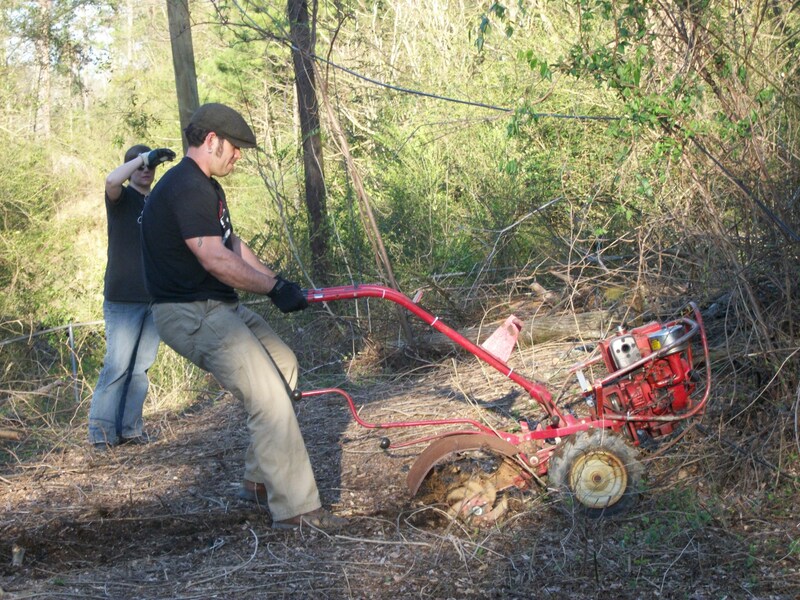 See, there’s something macho about running a tiller, especially one of this vintage. Running a tiller like this is equal to wrestling with a grizzly bear, or better yet, plowing with a bull, using the bull’s horns as the plow, while they’re still attached to the bull. I was all set to get the crap beaten out of me and in a weird twelve year old kinda way was looking forward to it, or rather I was looking forward to basking in the glow of masculine accomplishment that would come Sunday evening as I stood victorious over four or five neatly plowed plots ripe for planting. That and Monday morning when I could loudly proclaim how powerfully sore I was from all the hard work I’d done, thereby cementing my superiority in the hierarchy of hard working men and sending all those of weaker constitutions, who spent the weekend watching TV and drinking beer, off to sulk in self loathing. Instead, here I was Sunday morning ready to bail, to take the easy way out. My battle with myself was really over whether I was making a decision based on prudence or just because I was a wussy. A stupid distinction to be sure and again a “no-brainer” but here I stood wrestling with myself. Thankfully I married well. Gently but firmly she explained what a twit I was being and that I needed to quit messing around and get back to work. Filled with the resolve that only a wife can provide, I changed gears. I parked the tiller, pulled out the chainsaw and my cutting gear and felled those trees I could without causing undue damage to myself or my neighbors. Well, almost. I tried to be smart about it. Really, I did. I had marked several small and odd shaped trees for thinning and was starting with a relatively small oak that grew pretty straight. I cleared the ground brush around the tree and severed all ground attachments via wisteria vines. I noted the nearby power line and set my pie cut and back cut so as to assure that it fell parallel with the powerline. What I didn’t know was the amount of canopy wisteria present and how those vines tied my tree to adjacent trees. To my credit the tree did begin to fall in my intended direction but as the aforementioned vines became taut they changed the tree’s trajectory until it was now hanging perpendicular to the power line. Again we learn more about this man that is Dave. Once again, I pace and wring my hands. How am I gonna get out of this one? I said a small prayer to God (pick one) and my dad, asking first and foremost that I don’t hurt myself and then that I solve this dilemma as neatly as possible. As I faced down each of the possible outcomes the one constant was that whatever happened I knew I did not want to have to go next door and explain why Bobby and Annalise had neither power or cable. That was my biggest fear, not that I’d screw up and knock down a power line, make work for a power crew on a Sunday, and possibly set fire to the Back Forty. No, my biggest fear was that I’d have to go, knock on my neighbor’s door and explain why they wouldn’t be watching Extreme Home Makeover, ESPN or anything else that Sunday afternoon. Summed up my biggest fear was not that I’d be an idiot, it was that I’d look like an idiot. Somehow I dodged that bullet. I took a length of wisteria vine, a good inch in diameter, and looped it around the base of the trunk just above where it was wedged against the stump. Getting a good grip and checking my footing against the slope I pulled. Slowly I pulled the base of the tree a good ten or fifteen feet away from the stump until the trunk was close enough to horizontal that the weight of the tree broke the vine that held it and it fell, safely, to the ground. Now my fear was safely averted and while clearly I was an idiot I didn’t look like an idiot and that was what counted. I spent the rest of the day hauling twelve and four foot sections of tree trunk to form the borders of a raised bed. Thankfully, John Paul showed up around 3:00 and we got some serious work done. It’s amazing how much work you can get done with just one more helper. JP had the sense to suggest using tow straps to drag the last two logs which were too heavy for me to move by myself. In fifteen minutes we had doubled my day’s work out put. So much for not looking like an idiot. By dusk we had two framed beds that were laid out with rotting timber ready to be covered. In the next few weeks we’ll build the remaining two 4×12 beds, lay the wood layer and then cover that with compost and leaf mold. Stephanie found a lead for free composted horse manure not too far from here and the nearby city of Mountain Brook sells leaf mold for $20 a load. I’d like to get a layer of soil six inches over the logs and have it all done by mid-April. I’ll be out two weekends in March but I still think it’s doable. Yesterday, I spent my workout time finishing some of the tasks I didn’t get to on Sunday. I spread forty pounds of lime and forty pounds of pasture seed for the goats. I forked, hoed and tilled the 2’x16′ herb bed, turned the compost heap and added rails to the goat feeder in yet another attempt to keep them from pooping on their food. We’ll see. Love the picture. You a hard working man Dave! Far from an idiot. The ability to make plans, change decisions and alter ideas is HUGE. Trust me I know since that’s something I struggle with. I think the new plan is totally doable and how exciting to experiment with hugelkultur . I love learning new gardening techniques and this one is definitely new to me . Living and learning, love it! Not the greatest blog post in the world? I disagree. it is dynamic, heartfelt, honest and funny and every soul in America and beyond can relate to your experience and laugh (not at you, but with you) at the dilemma of being human in a natural world. Thoroughly enjoyable and you should “bask in the glow of masculine accomplishment.” Perseverance is as valuable as raw labor, if not more.